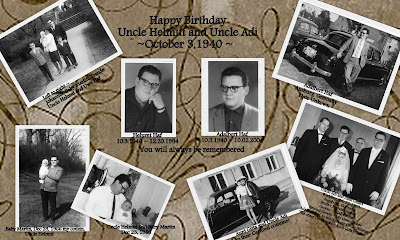 Adalbert 10.3.1940 ~ 10.2.2004 birthday's. They are dearly missed and forever in our hearts. A great tribute to your uncles - I love all the photos! Gini, I`m very happy to see a picture from your german family in your blog. It`s good to see, that Uncle Helmut and my Dad are not forgotten. Thank you my dear cousin Marion, I could never forget two very special people in my life that I love so very much. Miss you and love you too! What a beautiful tribute to your Uncles, Gini. They look down and smile at you each day and they will live on in your heart forever. Thank you, Betty . . . it's great comfort knowing that they are with me each and every day. Treasure Chest Thursday, Email Inbox Treasure! Thank you for nominating Ginisology!